By a stroke of fortune, aviation's birth closely coincided with that of the motion picture camera's appearance as a practical recording device. Because of this, images of pioneer aviators and their machines were preserved on early film by both amateur and professional cinematographers. Once motion pictures became recognized as a popular entertainment medium, filming groups and studios were quick to seek out airmen as a source of derring-do and adventure for audiences. Thus was the course of aviation documented in story form, although not always accurately, and its progress now can be reviewed at leisure in our homes thanks to videotapes and DVD. AeroFiles' extensive listing of known aviation features is as comprehensive and accurate as research sources permit, and will be amended as necessary and updated periodically to include new releases. As always, we welcome documented input from viewersif you have additional corrections or data, email us collect! Generally omitted from this list are films where airplanes only had a "cameo" role, and those airline disaster films which really have little to do with flight and are mostly stamped from the same mold. Special compilations of AAF and USN training and publicity films in WW2 by AFC, Blackhawk, and other similars are not listed because of their redundancies and our lack of information. 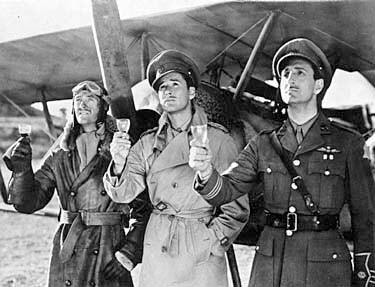 SEE ALSO the companion Stars in the Skies, about pilots in the entertainment world and show business, including those that flew for the cameras, and USAAF's Fort Roach, where celebrity-soldiers made movies for the war effort.